Readers will enjoy an inspiring historical romance set on a large Old West ranch from bestselling author Carol Cox. Judith Alder braves the Santa Fe Trail alone in search of a place for her heart to call home. Also includes the bonus sequel, Measure of a Man. 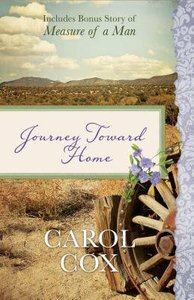 About "Journey Toward Home/Measure of a Man"
CAROL COX is an award winning author, a native of Arizona, whose time is devoted to being a pastor's wife, mom to her grown son, and a home-school teacher to her daughter, church pianist, and youth worker. She loves anything that she can do with her family: reading, travelling, historical studies, and outdoor excursions. She is also open to new pursuits on her own, including genealogy research, crafts, and the local historical society. She plans to write more historical inspirational romance, in which her goals are to encourage Christian readers with entertaining and uplifting stories and to pique the interests of non-Christians who might read her novels. Some of her works include Spring's Memory, Land Of Promise, Arizona Brides, Ticket To Tomorrow and To Catch A Thief.